The contact between Germanic tribes and Romans can be divided into four aspects; the military aspect, the trade aspect, the gift aspect and the plunder aspect. All these aspects give probable answers as to how and why Roman objects got into Germanic hands, and why a vast amount of Roman objects still can be found as far north as Norway. It is noteworthy to understand how Roman objects brought elements of Roman culture with them, and how they to some extent shaped Germanic culture and identity. The first contacts happened by the late 2nd century BCE, when Roman authors recount that Gaul, Italy and Hispania were invaded by migrating Germanic tribes. This culminated in military conflict with the armies of the Roman Republic, in particular those of the Roman Consul Gaius Marius. Six decades later, Julius Caesar invoked the threat of such attacks as one justification for his annexation of Gaul to Rome. As Rome expanded to the Rhine and Danube rivers, it incorporated many societies into the Empire. The tribal homelands to the north and east emerged collectively in the records as Germania. The peoples of this area were sometimes at war with Rome, but also engaged in complex and long-term trade relations, military alliances, and cultural exchanges with Rome as well. The Cimbri and Teutoni incursions into Roman Italy were thrust back in 101 BCE. 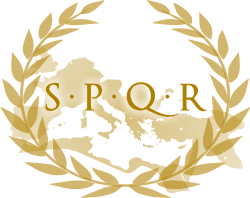 These invasions were written up by Caesar and others as presaging of a Northern danger for the Roman Republic, a danger that should be controlled. In the Augustean period there was — as a result of Roman activity as far as the Elbe River — a first definition of the "Germania magna": from Rhine and Danube in the West and South to the Vistula and the Baltic Sea in the East and North. North of Limes, there were only trade contacts between Romans and Scandinavia, mainly with Jutes of Denmark. Indeed, the Roman Empire maintained trade-routes and relations with Danish or proto-Danish peoples, as attested by finds of Roman coins. Depletion of cultivated land in the last century BC seems to have contributed to increasing migrations in northern Europe and increasing conflict between Teutonic tribes and Roman settlements in Gaul: Roman artifacts are especially common in finds from the 1st century in Jutland. It seems clear that some part of the Danish warrior-aristocracy served in the Roman army. Members of different Germanic tribes and communities served in the Roman legions, and fought with the Romans. It's probable that for instance Germanic Chieftains who fought with the Romans, tried to adapt to, and adopt, Roman culture, and that they tried to identify with the Roman nobility. In exchange for military service, the Germanics got Roman objects, although not Roman weapons, as there were Roman laws against exporting arms to the Germanic tribes. Germanic tribes who fought against the Romans got war spoils, and they often used captured Roman swords and armour. The Romans probably influenced Germanic military tactics and organisation as well. As can be told from the huge Illerup Ådal excavation in Denmark, in which huge amounts of Roman and Roman inspired arms and equipment were found. A lot of these were probably produced in Scandinavia, and a lot had Scandinavia "factory seals", after a Roman model. This not only tells us that the Germans did indeed use Roman arms, but it also tells us that they had the required knowledge and social organisation to support large armies, and produce standardised arms and equipment. We do know that the Spangenhelm shows barbarian contact with another civilization […]. We also know that it was an important object of personal adornment as well as protective value […]. The man who wore such a headpiece was no longer a skin-clad barbarian…. Grancsay's text may be outdated, but it's still interesting, because Grancsay points directly at concrete examples of how Roman culture helped shape Germanic identity, by ways of objects. He also suggests that these Roman objects embody the factors that made the basis of the Germanic warrior aristocracy that developed alongside and following the Roman Empire, such as the notable Himlingøje Dynasty, in the ways which the Romans may have supported Germanic tribes due to military regards, and equipped these tribes. And there may have been Germanics of a high class who participated in fights with or against the Romans, and thus acquiring Roman objects and Roman ways of thinking in military terms (strategies, organisation, etc...). It has been suggested that the Romans supported and equipped Germanic tribes in the part of Germania which is today's Denmark. Archaeological sources tell of Roman equipment and arms that have been discovered as far north as Scandinavia. Danish archaeologists: Lars Jørgensen, Birger Storgaard and Ulla Lund Hansen have suggested Germano-Roman alliances, in which Romans supported a Germanic power in today's Denmark. According to Jørgensen, this was either to destabilize Scandinavia, or to create a Roman friendly power which could help ensure peace and stability in the border areas. Ulla Lund Hansen and Birger Storgaard have also suggested that Roman interests in Scandinavia were strong, and that there was direct contact. Storgaard alluded to a text written in accordance with an expedition led by Tiberius in year 5 A.D., in which Tiberius describes what has been interpreted to be Jutland, in Denmark, although this interpretation is based on myth. Jørgensen points to the Gudme-Lundeborg complex in Denmark. Archaeologists have found Roman coins and scrapmetal at Lundeborg, a trading place in relation to this complex. Hansen, Jørgensen and Storgaard interprets from these archaeological finds that Lundeborg may have functioned as a Roman port. ”…At all periods Rome needed to have some kind of relationship, friendly or otherwise, with her neighbours…”. It's thus very likely that a lot of the Roman objects found in Scandinavia arrived via trade and trade networks. Grain was a significant commodity in the Roman society. This trade may have been carried out via already existing trade networks, from the Mediterranean, via Germanic Chieftains to Scandinavia. These trade networks may have been established prior to the Roman Empire and suggest a complex and advanced social structure and organisation among the Germanic tribes and societies. Scandinavian amber has been found at Mycene, in Greece. This brings the term "tribe" into question, many archaeologists have abandoned this term because it provides a faulty image of the Germanics. This term may envision an image of Germanics as primitive people. "Rome was perhaps concerned to cultivate these Germanic tribes in order to counterbalance […] their neighbours. Diplomacy rather than military strength kept the peace along […] the frontier." The Roman empire became increasingly vulnerable as they expanded, thus stretching their military capacity. Pitts go on to write that the Marcomans were a very strong military power, with a standing army of 7000 infantry and 4000 cavalry. It's obvious that the Romans wanted to maintain peaceful relations with certain Germanic tribes, especially towards the end of the Roman Empire, when it became ever increasingly weak. Pitts points out that ”…it is apparent [sic?] that, apart from short periods of hostilities, relations between Rome and the Marcomanni and Quadi were friendly…”. It became more and more common, as the Roman Empire neared its end, that the Romans paid tribute to Germanic armies who threatened to invade Rome. This takes us to the plunder aspect. As the Western Roman Empire collapsed, Germanic tribes reclaimed land taken by the Roman Empire. Thus many Roman objects were obtained, proliferating throughout much of Germania, most likely via the already existing trade networks, all the way to Scandinavia. War spoils may have also added to proliferation of Roman artefacts. This may also explain the high number of Roman arms in Germanic hands, despite the Roman arms embargo. Two silver cups found in a grave in Hoby, in Denmark, are likely to have been war spoils from the Battle of the Teutoburg Forest in 9 A.D.
↑ This article is based entirely on a paper written by Are Skarstein Kolberg as part of the Bachelor's degree in Archaeology at the University of Oslo in 2007. ↑ Birger Storgaard, Cosmopolitan aristocrats, pp. 106-125 in: The Spoils of Victory - The North in the shadow of the Roman Empire, Nationalmuseet, 2003. ISBN 87-7602-006-1. Dobson, Dina P., 1936 Roman Influence in the North, Greece & Rome, Vol. 5, No. 14, p. 73-89, The Classical Association. From Jstore.org. Granscay, Stephen V., 1949 A Barbarian Chieftain's Helmet, in The Metropolitan Museum of Art Bulletin, New Series, Vol. 7, No. 10, p. 272-281, The Metropolitan Museum of Art: New York. From Jstore.org. Hansen, Ulla Lund, Jensen, Xenia Pauli og Jørgensen, Lars 2003 Den germanske hær: krigere, soldater og officerer, in Sejrens triumf, Norden i skyggen af det romerske imperium, edited by Lars Jørgensen, Birger Storgaard and Lone Gebauer Thomsen, p. 310-328, Nationalmuseet, Copenhagen. Jørgensen, Lars, 2001 The Warriors, Soldiers and Conscripts of the Anthropology in Late Roman and Migration Period Archaeology, in Military Aspects of the Aristocracy in Babaricum in the Roman and Early Migration. Periods: Papers from an International Research Seminar at the Danish National Museum, Copenhagen, 10–11 December 1999, edited by Birger Storgaard, p. 9-19, Publications from the National Museum: Copenhagen. Kolberg, Are Skarstein, 2013. Aspekter ved utveksling mellom Romerriket og Skandinavia i yngre romersk jernalder. Nicolay arkeologisk tidsskrift, Oslo. Pitts, Lynn F.,1989 Relations between Rome and the German 'Kings' on the middle Danube in the First to Fourth Centuries A.D., in The Journal of Roman Studies, Vol. 79, p. 45-58, Society for the Promotion of Roman Studies. Randsborg, Klavs, 1988 Byen, Magten og Jorden: Europa i det første årtusind, in Fra stamme til stat i Danmark: jernalderens stammesamfunn, vol. 1, edited by Peder Mortensen and Birgit M. Rasmussen, p. 9-18, Aarhus universitetsforlag: Århus. Storgaard, Birger, 2001 Himlingøje - barbarian empire or Roman implantation?, in Military Aspects of the Aristocracy in Babaricum in the Roman and Early Migration Periods: Papers from an International Research Seminar at the Danish National Museum, Copenhagen, 10–11 December 1999, edited by Birger Storgaard, p. 95-107, Publications from the National Museum: Copenhagen. 2003 Kosmopolitiske aristokrater, in Sejrens triumf, Norden i skyggen af det romerske imperium, edited by Lars Jørgensen, Birger Storgaard and Lone Gebauer Thomsen, p. 106-125, Nationalmuseet, Copenhagen.